How Will States Handle New Title I Powers with Minimal Federal Oversight? 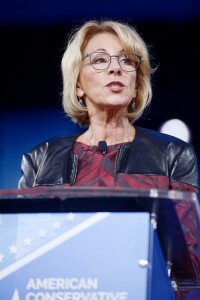 Last week Congress threw Every Student Succeeds Act (ESSA) accountability regulations out the window, and all signs from the Department of Education under Secretary Betsy DeVos point to a minimal review of state ESSA plans. For example, a little known ESSA provision could change the shape of Title I spending in schools, and under new guidelines, states don’t even have to describe their plans for implementing this new power. Title I is a $14 billion federal grant program aimed at supporting low-income students. For decades, Title I programs have been split into two categories: targeted programs, where funds exclusively support low-achieving students, and schoolwide programs, where funds can support schoolwide improvements more flexibly. Prior federal law restricted schoolwide programs to schools with more than 40 percent low-income students. Under ESSA, all states now have the power to waive the 40 percent requirement and allow schools with less concentrated poverty to implement schoolwide reforms using Title I funds. This new flexibility could make Title I programs more effective for disadvantaged students — if states step up and use their new power wisely. But, while the Obama-era regulations required states to explain how they would issue schoolwide Title I waivers, the new template issued yesterday by the Trump administration doesn’t ask states about this provision. There are several upsides to the expansion of schoolwide programs. Schoolwide Title I programs require schools to perform a comprehensive needs assessment, while targeted programs do not. These needs assessments are designed to engage the whole school community, and use data to identify to key areas for improvement. In contrast, a common criticism of targeted Title I programs is that they encourage schools to implement small add-on programs, like tutoring, rather than addressing bigger issues that impact all students, like curriculum and teacher quality. Schoolwide programs also allow for Title I funds to be combined with other federal and state funding streams, amplifying the impact of multiple small funding streams and reducing administrative overhead. But there are risks that come along with this flexibility. Title I’s convoluted funding formulas already give plenty of money to wealthy, large school districts, and unchecked flexibility in spending could further dilute the effects of Title I on its intended beneficiaries — low-income students. While combining multiple funding streams reduces administrative burdens, it can also remove guardrails to ensure that money is being spent responsibly and equitably. That is why state monitoring of school Title I plans and interim progress indicators are all even more important under ESSA. In a few states, schools below 40 percent low-income students are already allowed to implement schoolwide Title I programs. Even before the passage of ESSA, the Education Flexibility Partnership Act (Ed-Flex) approved ten states for Title I flexibility beginning in 1999. More recently, several states used their No Child Left Behind Flexibility Waivers to allow for schoolwide Title I programs in their lowest performing schools. The success of this new nationwide flexibility will depend on states taking an active role to monitor and assess schoolwide Title I programs — whether they are enacted at schools above or below the 40 percent threshold. Early drafts of ESSA state plans suggest that many states do not yet have a clear vision for this — and now they don’t even have to include details on Title I waivers in their state plans at all. Out of 15 draft ESSA state plans available online last week (all likely to be rewritten), nine states had very broad, non-specific language for how they would review requests to shift to a schoolwide Title I program. Light oversight is no excuse for states to take it easy. States should not just rubber-stamp requests for flexibility when it comes to Title I when there is so much at stake for low-income students, and advocates should push for more specifics on how states will ensure Title I money is well-spent. This entry was posted in Education Policy, Federal Education Policy, School Funding, State Education Policy and tagged Achievement gaps, Betsy DeVos, Donald Trump, ESSA, Every Student Succeeds Act, school finance, School Improvement, Title I, Trump education, US Department of Education on March 14, 2017 by Bonnie O'Keefe.